The parachute drop of thousands of men along the coast of la Manche marked the start of the Normandy Landings. 4 years later, the U.S. military had decided to drop two divisions of paratroopers on the night of 5th to 6th June 1944, to protect the landing sector of Utah Beach. Their mission was to stop German efforts to counter-attack along the beaches. The regiments of the 82nd Airborne led by General Ridgway and the 101st Airborne led by General Taylor were successively airdropped between Sainte-Mère-Eglise and Carentan. Flooded land required a powerful airborne attack. 811 C-47 aircraft dropped 14 238 men above the east coast of the Cotentin peninsula, establishing a bridgehead in Sainte-Mère-Eglise. 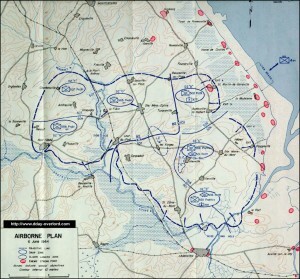 This was the assault phase, called Operation Overlord. At 10.15 pm, 432 C-47 aircraft took off from England with 6 600 men of the 101st Airborne and a half hour later, it was the turn of the aircraft carrying 6 400 paratroopers of the 82nd Division. As they approached the coast of Normandy, the men prepared to jump and were focused on their directives. On the ground, pathfinder teams were hard at work marking the landing zones. The drops could begin. Unfortunately, paratroopers rarely landed in the intended location and sometimes found themselves miles away from their drop zone. 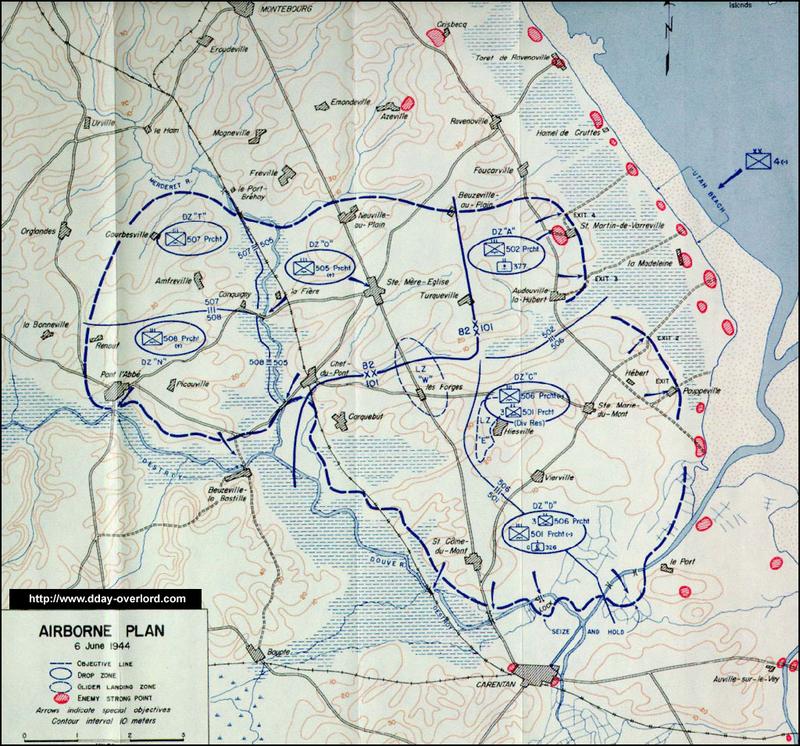 The five drop zones were surrounded by marshes and presented a heavy risk of casualties, making Overlord a difficult operation. For much of the night, isolated men had to walk, lost in a maze of hedges or wading through marshland. Nearby German patrols were actively looking for them. Those who found or reformed units made their way toward their objectives.